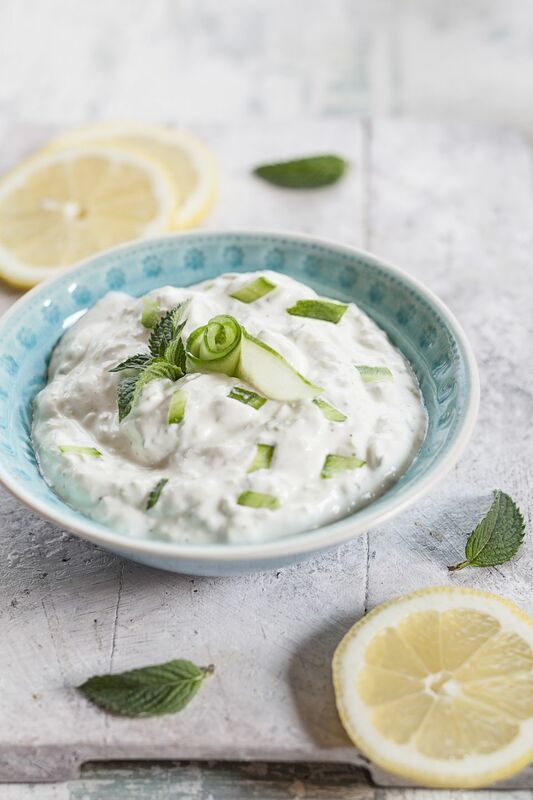 Tzatziki is a traditional, Greek cucumber yogurt dill sauce that makes a refreshing dip or topper for gyros and pita sandwiches, but it can also be used as a dip for fresh vegetables or pita bread. Though fresh dill is the more common ingredient, tzatziki can also be made with fresh mint. The sauce can be served chilled or at room temperature, but be sure to plan ahead to account for required refrigeration time. Also plan ahead to drain the yogurt overnight. Though some tzatziki recipes call for blending the cucumber and yogurt for a smooth texture, this recipe leaves the cucumber finely chopped for a chunkier and more hearty texture. This recipe appears in The All New Good Housekeeping Cookbook, edited by Susan Westmoreland, reprinted with permission. If using regular plain yogurt (not Greek-style yogurt), spoon yogurt into a sieve lined with cheesecloth or coffee filter set over a bowl; cover and refrigerate overnight. This process will drain excess moisture from the yogurt and produce a thicker, creamier texture. After yogurt has been strained overnight, transfer drained yogurt to a medium bowl, and discard liquid. Meanwhile, in a colander set over a bowl, toss chopped cucumber with 1 teaspoon salt. Allow salted cucumber to drain for at least 1 hour at room temperature, or cover and refrigerate for up to 8 hours. Once ready, wrap chopped cucumber in a kitchen towel in batches, and squeeze to remove as much liquid as possible. Pat dry with paper towels then add to bowl with yogurt. With the flat side of a chef's knife, mash garlic to a paste with remaining 1/2 teaspoon salt. Add garlic, chopped mint or dill, olive oil, wine vinegar, and pepper to yogurt and cucumbers, and stir to combine. Cover and refrigerate for at least 2 or up to 4 hours before serving. Serve tzatziki sauce chilled or at room temperature, topped with cucumber slices and mint sprigs. *Cook's Note: For a thicker, creamier texture, you can substitute your regular plain yogurt for low-fat plain Greek-style yogurt, which will help you avoid the first two steps of straining the yogurt and will also add to the protein content. Per tablespoon (using regular plain yogurt): about 17 calories, 1 gram protein, 1 gram carbohydrate, 1 gram total fat (0 gram saturated), 1 mg cholesterol, 182 mg sodium.